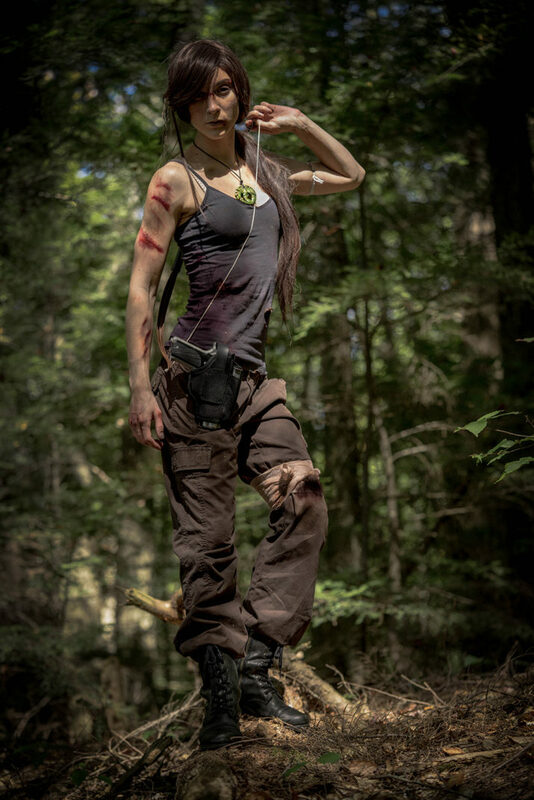 Lara’s costume was surprisingly easy to put together. I did a bit of crafting to make her necklace from some sculpey and paint, and to destroy her clothing. It’s a bit frightening to learn just how flammable some material is. Not to worry, I was very cautious while lighting the shirt on fire in my kitchen sink with the water hovering over the flame at all times! I also created some blood stains with hibiscus tea and dirt stains with coffee grounds and, well, dirt. What really brought it together was the makeup. 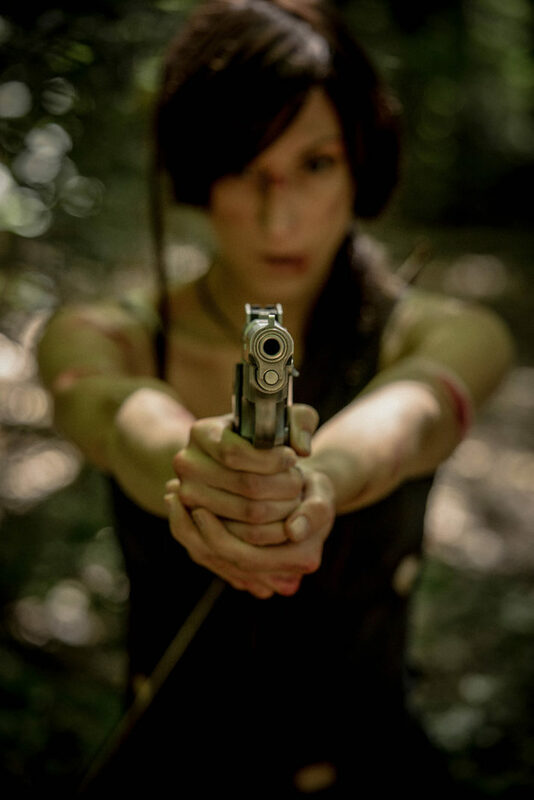 I made sure to spend my time creating realistic bruises, scratches, and cuts with the makeup I had on location. At one point I accidentally smeared a “wound” from my arm onto my shirt, and it ended up looking 100 times better! For weapons, I bought a dollar store bow and arrow set and carried the bow around with me. It didn’t look realistic at all, but it got the point across without needing to spend more than $5. 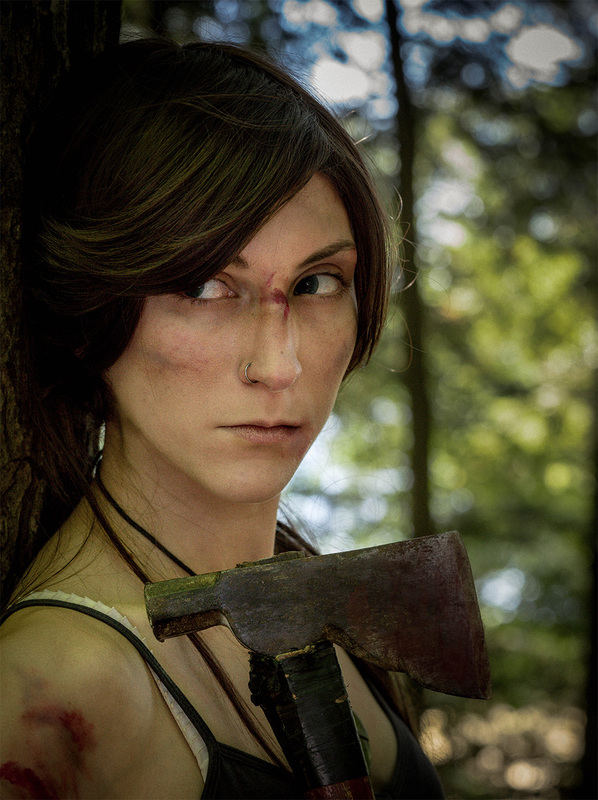 I also borrowed an axe and (empty) gun to complete Lara’s arsenal. 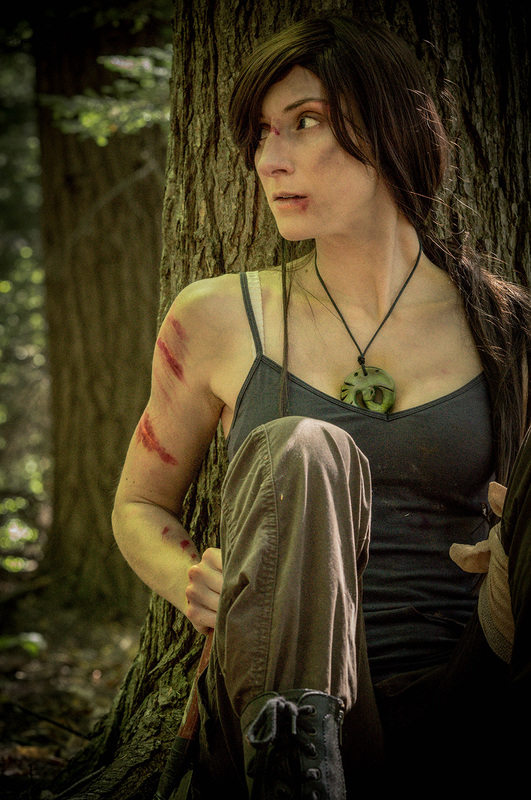 At one point while trying to get into character, I slumped down onto a fallen tree trunk and lodged my ax into it. Bad idea. What I didn’t realize was this rotted log was home to a large quantity of ground wasps. Within seconds, there were about ten wasps flying out of the log, followed by many, many more. I’ve never crab walked away from something so quickly or cautiously in my life. Somehow, I didn’t get a single sting, and eventually managed to get the ax back as well, but that could have ended very badly! By the end of the shoot I was exhausted, sweating, and covered with more dirt than anticipated. But it was well worth it for these shots! Maybe next year I’ll finish the suquel game and create her second costume!